Get this LIMITED EDITION Android smartphone for only Php6,499! Cherry Mobile just announced on their Facebook page a limited edition WHITE variant of the popular W500 Titan! For only Php6,499 (same with the black Titan), the 5-inch Cherry Mobile Titan White boasts (the same specifications with that of the black Titan) a 1GHz dual-core processor by MediaTek, a dual-SIM, dual-standby capability, a 5MP camera with LED flash, VGA front camera and runs Android 4.0 ICS as its OS. Because some things just look better in white! More about the Cherry Mobile Titan White specs after the jump. If you already own this phone, please share some of your experiences and opinions about this phone, so that others may be aware of it. Thanks! 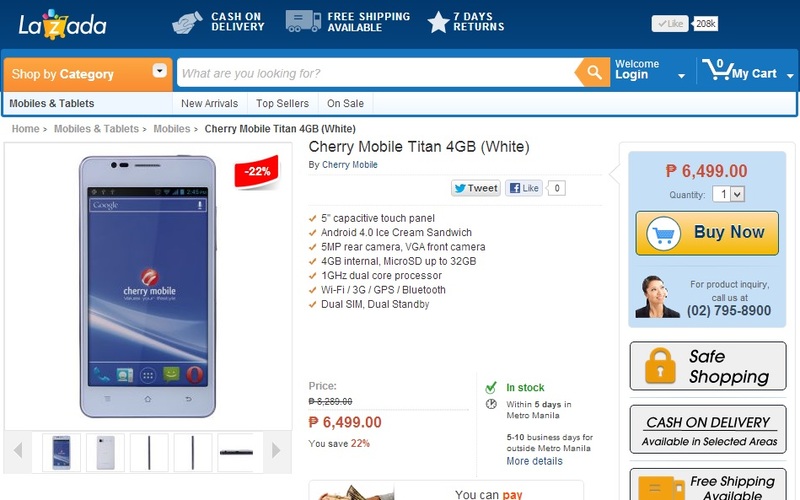 (01/04/13) The Cherry Mobile Titan White is now available at Lazada Philippines, the fastest-growing online shopping site in the country that offers a wide-array of products and provides a convenient, worry-free online shopping experience with – free nationwide delivery, 14-day return policy and cash on delivery. Thanks po :) Sa original Titan pa po yung specs kasi.